Early in the morning, before dawn even broke, we departed the Apu Lodge and went on a short, but bumping bus ride to Piskacucho, the official start to our Inca Trail adventures. 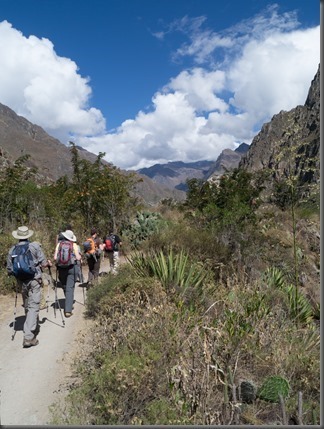 Here we met up with our porters, and made sure our packs were all distributed, then we crossed the bridge and headed down the Urubamba canyon. 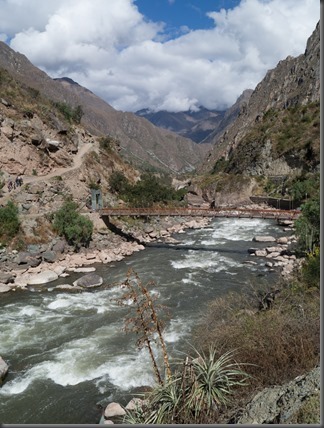 Our first glimpse of the ruins on the Inca trail were only two hours into the hike when we came upon a lookout that you could see the garden terraces and settlement of Llaqtapata which sits on the bank of the Cusichaca side river. After a short break to take some pictures we climbed a short way up the Cusichaca valley to Huayllabamba, where our porters had already set up camp and started cooking us dinner for the night. The company we used as our guides was quite nice. Each night, when you would come into camp, they would have the tent all set up with your gear sitting in it. You could lay in it and relax for a little while since trekking at this altitude can be quite tiresome. After a bit of a rest, they would come around with something to drink, and a bowl of warm water to wash up in. After washing up you would make your way into the dining tent where they would bring in a lot of really good food to eat. This wasn’t the kind of food one would expect on a backpacking trip. It was excellent food and each night was very different. We had stews, all sorts of potato’s (Peru is home to thousands of variants of potato), quinoa, ceviche, and different kinds of fruit. Each night you would want to keep eating more and more of the food until you were stuffed and barely able to haul yourself off to bed. In the mornings they would come around with a wash basin full of warm water, and a cup of tea to warm you up. You would make your way groggily out of bed and over to tent for another exquisite meal. 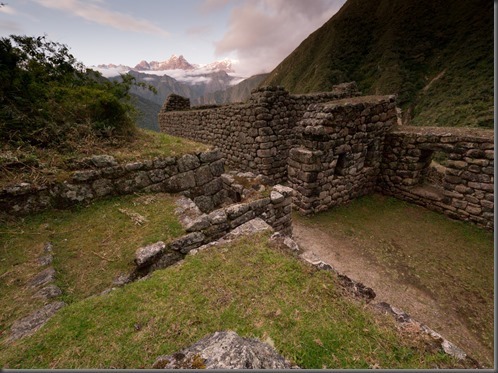 The entire length of the Inca trail is made up of cobbled stones and a whole hell of a lot of stairs strung out over 26 miles. 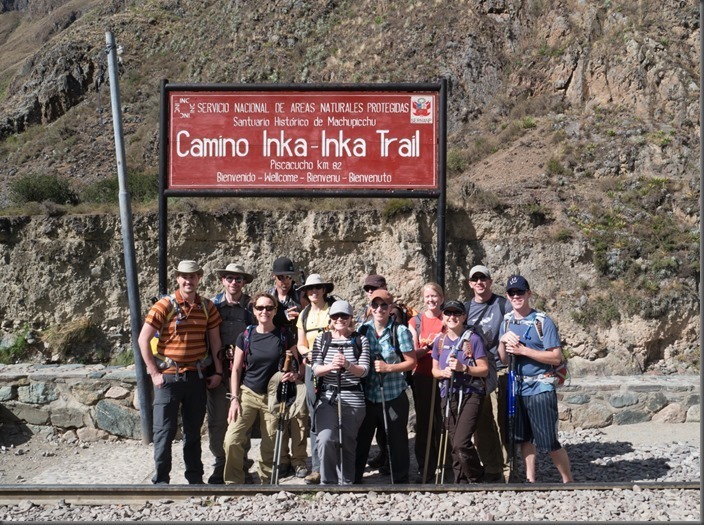 The second day on the trail we made our way way up the steep-sided Llullucha valley and through subtropical woodlands. Crossing the rim of a small plateau, we found ourselves in the pula, the treeless grasslands of the high Andes. 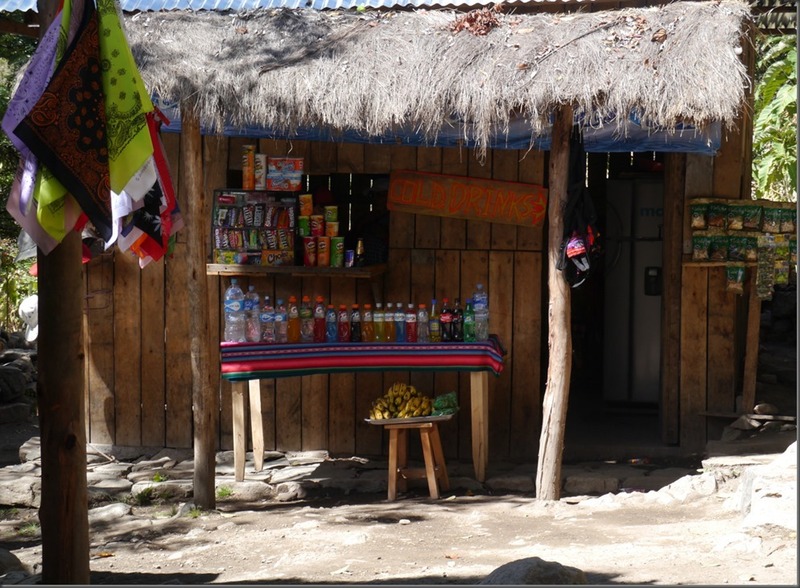 After a break to catch our breath, and for Spencer to take advantage of a last chance of getting some alcohol from the locals, we headed up to the first pass and the highest part of our trek, Warmiwañusqa (Dead Woman’s Pass). Our guide tried his hardest to convince us that it looked like a dead woman. Maybe you can see it … but I guess my imagination is just not that great … or could be because I’m gay and have a hard time visualizing a woman laying down… From he top of the pass you get spectacular views of both valleys, plus of snowy peaks of Huayanay. From here we made our way down to the floor of the Pacaymayo valley, where we camped for the night. 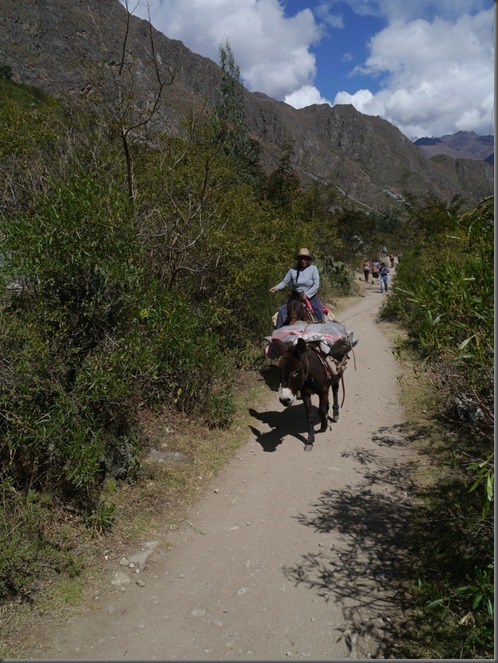 The next morning we picked up on the Inca stairway again and ascended past the small Inca site of Runkuracay which was used as an outpost watching for people invaders down the valley. As we reached the second pass, the landscape opened onto spectacular new views of the snowy peaks of the Pumasillo range. 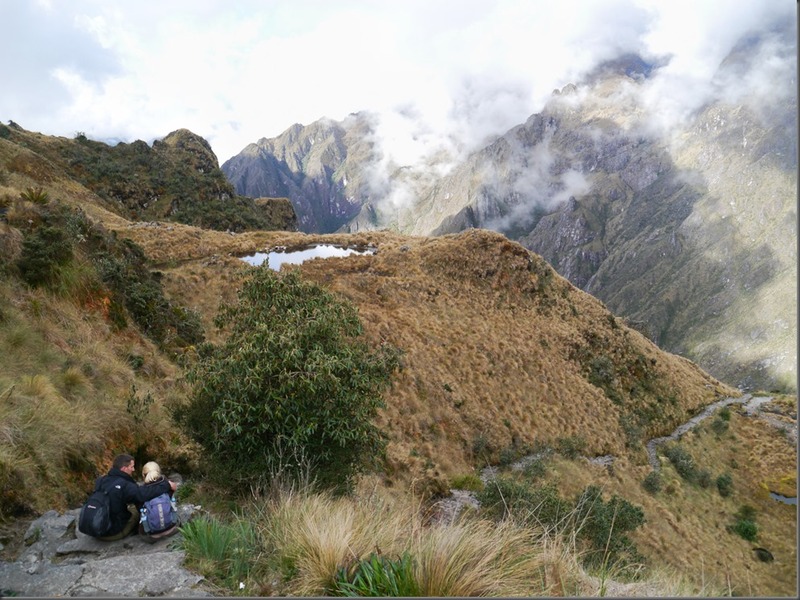 We descended to the ruins of Sayacmarca, an intricate labyrinth of houses, plazas, and water channels, all perched on a rocky spur overlooking the Aobamba valley. 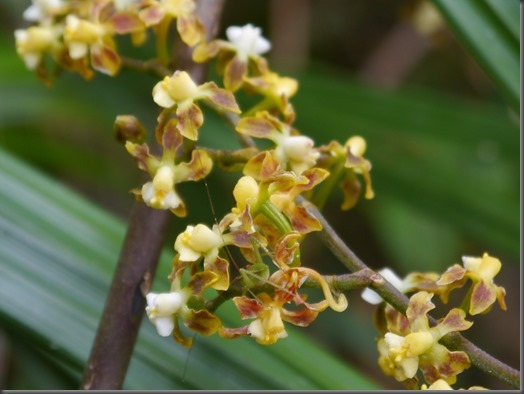 We continued on and descended into the cloud forest, with it’s abundance of orchids, bromeliads, mosses, and ferns.. This orchid picture is one of my favorites, not for the beauty of the picture, but instead, if you zoom in and look closely you will see an insect hiding in it. Our next stop of ruins was the mist covered complex of Phuyupatamarca (Cloud-Level Town). I didn’t have time to stop there since we were running a little slow as the hike was taking a toll on our joints (Did I mention there were a lot of stairs …) We finally made it down to our final camp by the ruins of Wiñay Wayna (Forever Young). Once we got at camp, our guide let us know that there was an owner of one of the buildings that, for a price, would let us take a shower in his facilities. It was all hush hush since he apparently wasn’t suppose to be operating any type of business there. But, we were willing to take the risk, and after what felt like a drug deal, Brian and I got our turn. The showers scared the hell out of me. There isn’t a normal water heater like what we have in the US. At this place the water heater was on the shower head itself. The power was hooked up by a few wires dangling right next to the running water and didn’t have any wire nuts or any other insulation on them. (Maybe this is why he wasn’t suppose to be operating ….) The water was very temperamental and I couldn’t get a continuous stream of lukewarm water. Mostly because I was afraid to touch let alone adjust the water control out of fear of being electrocuted to death. 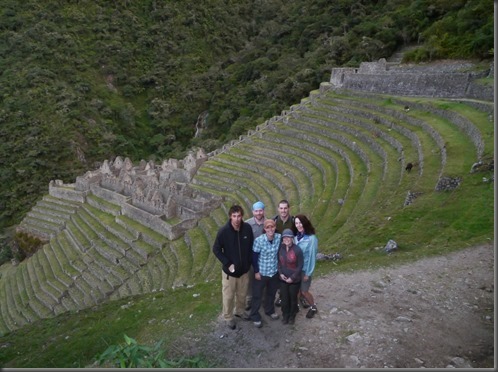 After taking a short break at camp a few of us made our way down to check out the Wiñay Wayna ruins. A few of the members of our group, including the couple from the UK, our youngest member, and a few others stayed behind because they were getting tired or sick. The altitude has a not so pleasant effect on your body. While waiting in our tent later we heard a few people vomiting and groaning. That night we had an all out feast with our guides and stayed up a little later chatting about adventures and cultural differences. A few of the group had a few drinks .. and a few others had a few too many… But I was exhausted, so Brian and I headed to bed. And then things went downhill for me … more to be come.